Analysts and commentators think the Federal Reserve will raise interest rates in December, which could further fuel the rally in Bank of America’s stock. Bank of America's (NYSE:BAC) stock has been on a tear since the presidential election, with analysts and investors speculating that the incoming Trump administration will push through policies that will make it easier for banks to make money. To get a sense for how optimistic Bank of America investors are, all you need to do is look at a chart of its stock over the last few years. See that sharp upturn on the far right? That's because of the election. But even though this rally has been great for Bank of America's current investors, myself included, it could lead prospective investors in the nation's second-biggest bank by assets to stay on the sideline, concluding that there isn't any upside left in its stock. I'm sympathetic to this argument. Over the past week in fact, I've even considered that now may be a good time to sell my shares, given that they've risen more than 70% since I bought them at the beginning of the year. There are two things that keep me from doing so, however. The first is that I'm well aware that investors can rarely call the top. Research has shown that trying to time the market is never a good strategy upon which to base your investing. Second and just as important, it isn't unreasonable to think that Bank of America's stock could still head higher from here. And it could do so in December if higher interest rates come to fruition. The narrative around bank stocks right now revolves around rising rates. Holding all else equal, if rates go higher, so too will bank profits. And if bank profits head higher, so too should bank stock prices. This is because banks generate revenue by originating loans and then holding them on their balance sheets -- the higher the interest rate they're able to get on their loans, the more money they make. As I've noted frequently of late, Bank of America says it'll earn $5.3 billion in additional net interest income in the 12 months after short- and long-term rates rise by 100 basis points, or 1 percentage point. 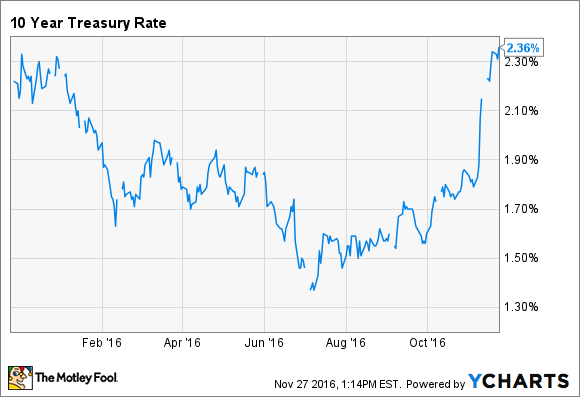 Long-term rates have already headed in this direction. You can see this in a chart of the yield on 10-year Treasury bonds, the most frequently cited long-term interest rate benchmark. At the beginning of October -- after Bank of America estimated the impact of higher rates on its income statement -- the 10-year Treasury yield was 1.6%. Fast-forward to today and it's nearly 2.4%. That equates to an improvement of nearly 80 basis points. The big question now is whether short-term rates will follow suit. This depends on the Federal Reserve's monetary policy. Fed Chair Janet Yellen has signaled that the central bank is looking to increase rates "relatively soon." And minutes from its most recent meeting, held on the first two days of this month, showed that officials at the central bank wanted the economy to continue improving before they pulled the trigger on higher rates. Since then, that's exactly what's happened, with a wave of positive economic news coming out. The net result is that the Fed could very well end the year with a rate hike, much like it did last year. 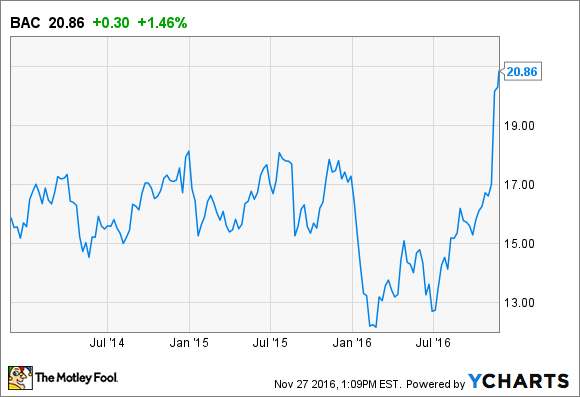 And if it does so, it'll reinforce the bull case for Bank of America's stock.